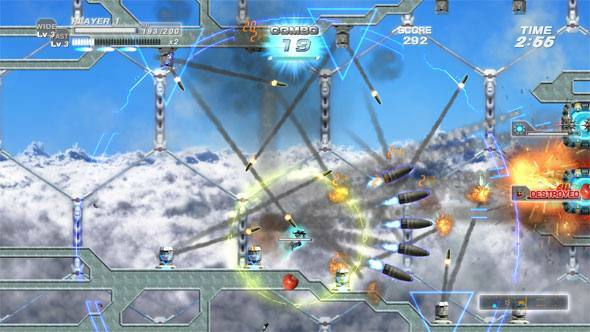 When the series was birthed on the Dreamcast, Bangai-O, a different kind of shooter, became a cult darling with its Ikaruga meets Robotech game play and visual flare. When the next iteration in the series comes out as an XBLA exclusive in November for 800 MS points, fans familiar with the original have something to look forward too. Hit the jump for my impressions of the game from PAX Prime. Gameplay and visuals work in complimentary unison. Levels are played out in front of a fixed background. One stage was a gorgeous space vista, filled with purple streaks, stars, and darkness. The other was a kind of light blue. I’ve been told there will be a handful of these backgrounds, but no official numbers. Level design has you jetting through a 2D outline, working your way through a path of enemies of varying sizes, shapes, attacks, and strategies. Each corner acts as a mini checkpoint where you can catch your breath and plan your assault for the next turn. Charged shots can be played either as lifebelt amid the storm or with cocksure aptitude for skilled players as the bullets swarming around you direct effect the power of the blast. The closer you are to the bullets, the more bang squeezed out. The effect was similar to Crazy Taxi and drifting closer to cars to earn more cash. Expect veterans to be dancing around, letting bullets whiz by for flare and to intensify power while lesser players, including myself, use the charge as a last resort. To say the screen is a bit busy may be the understatement of PAX Prime. Lights, lasers, flashings, fruits (the health boosts that this time come to you), numbers, symbols, and a medley of other distractions lie in wait. With all this fuss going on though, I rarely lost my place thanks to some helpful cursors and fluid camera follow-movements, zooming in and out depending on you position on the map. The busy nature of the game give is a grandiose scale of action. Bangai-O was almost as fun to watch as was to play. Bangai-O boasts fifty story levels and sixty unlockable bonus levels. The real treat will be the level editor and being able to download user created levels, extending the game’s life by giving masochistic players a sadistic outlet and a view into their twitchy minds. Currently, you’ll be able to store only ten levels at a time due to space limitations. It didn’t sound like this was going to change, so prepare to do a lot of map swapping. We didn’t get into the nature of how downloads, storing, and deleting levels would be handled. You will not be able to customize your weapon options. Each level has its own preset weapons, supposedly chosen as an addition channel for level design. I only played a few levels, but the specifics of the weapons didn’t seem to affect much in terms of game play. Weapon mechanics are a bit of a mixed bag for me. On the good side, your weapons power up as you chain enemy kills for combos. No only is it rewarding as a survival and scoring technique, its also visual pleasing. My homing missiles did greater splash damage and began to grow in size, sometimes to proportions that dwarfed my shipped. The disappointing news is that there are only seven weapons and the ones I used seemed to play the same and can be categorized into lasers or missiles without much thought. Finished art or cut scenes weren’t present in the build I was playing, but some placeholder concept art had me drooling. Think the scrawly scenes from Metal Gear Solid 4 meets Valkyria Chronicles 2, and add in a pinch of futuristic diesel punk. I unfortunately cannot comment on the music because Kinect’s dance game feature one booth over was too damn loud. SHUT UP KINECT NO ONE LIKES YOU!!! My overall feelings for the game were positive and this looks like another fun hybrid shmup from the good series. Others who played the game felt more strongly than I and I was pretty happy with what I played. Expect your way-better-at-videogames friend to try and convince you to try this one come November. This time, you should listen to him. Ok, I’m pretty much already convinced. Bangai-O deserves to be played by everyone. But man, its hard. But of course it’s hard, it’s all Treasure know. Seriously people. Get this thing. It plays much more like the awesome DC version than the not-that-awesome DS version. Making it a Twin-Stick shooter was also a good choice, since it feels perfect. Also, I love the new boost mechanic. Makes things even faster and more hectic. I was just playing Bangai-o yesterday as part of the DC Anniversary day! It was shooting madness with this, Gunbird, Ikaruga and Mars Matrix. Can’t wait for an updated Live version.